A programme of 5-10 two-hour sessions that take cross curricular learning out into the woods for hands on, practical learning for the whole class. Pick from one of our suggested topics or work with your own. 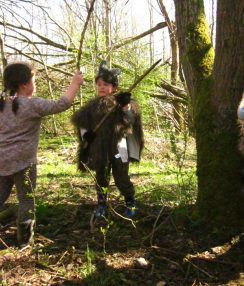 Forest Schools is a particular approach to Woodland Learning that focuses on social, emotional and personal development of children. It works best with small groups, no more than 15, and is particularly effective with children who are struggling in the classroom, such as a nurture group. 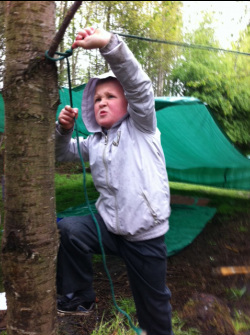 Learners will set up camp in a woodland site and take part in a range of practical tasks such as den building, campfire cooking, natural crafts, group games and nature exploration. Children's self-esteem and resilience is nurtured through a careful balance of free play, child led learning and taught skills. Wild Sparks CLPL & training builds teachers' skills, confidence and enthusiasm for outdoor learning. "Using the real world is the way learning has happened for 99.9% of human existence. Only in the last 100 years have we put it in a little box called a classroom"
- - Will Nixon, letting nature shape childhood.